If there is a topic in orthodontics that is chronically ignored and sometimes abused, I think most of us would agree, it is retention. In fact, if you try to track down all of the articles written on retention since the specialty's formation back in the early 1900s, it would only number a couple of hundred, while other aspects of orthodontics have been discussed nearly ad nauseam. But retention—should we be ignoring this important part of treatment like this? I know, nothing makes for a more frustrating day like several college students home for the holidays with lost or broken retainers and several rotated teeth, no responsible parents in sight, and a crowded waiting room. Some practice consultants advocate not seeing these patients ever again! Is that a way to build a practice dependent on new patients replacing the ones that are treated? I dare say not! It's no secret that once the bill has been paid, the teeth are straight and a patient gets retainers, there's not a lot more for an orthodontist to do. But as the model of orthodontic care continues to evolve, I propose that there will be the standalone practices where the orthodontist visits on a daily basis in an established practice and the corporate model, which addresses that population of patients in retention. And, frankly, those of us wishing to control the business may want to keep these patients coming back. Back in the early '80s when I broke into the industry, the most popular forms of retention were ball clasps and interproximal retention for finished cases, and the Adams clasp on deciduous and mixed-dentition cases. In orthodontics, retention is support that is given to the tooth in order to maintain the position in which the tooth is meant to stay after being treated. As simple a premise as that sounds, the reality of it is a fine and sometimes frustrating science. The type of case and where the retention is needed will determine which type of clasp should be used. There are many types of different clasps used for retention, and each one can offer specific benefits. One of the most successful was proposed in 1955, which we now refer to as the Adams clasp. The Adams clasp does not separate teeth and can be placed on any tooth, including a semi-erupted tooth, as long as it is modified. It has been my experience that the Adams clasp in retention works better than any clasp on deciduous and mixed dentitions. Ball clasps are difficult to adjust, and not useful if the adjacent tooth is absent. They can be purchased from several companies. In my experience, a custom clasp can improve retention. The clasp lends itself well to modification in the right hands, as the auxiliary springs, hooks and clasp can all be modified as needed to bridge the clasp and assist with maxillary elastics. 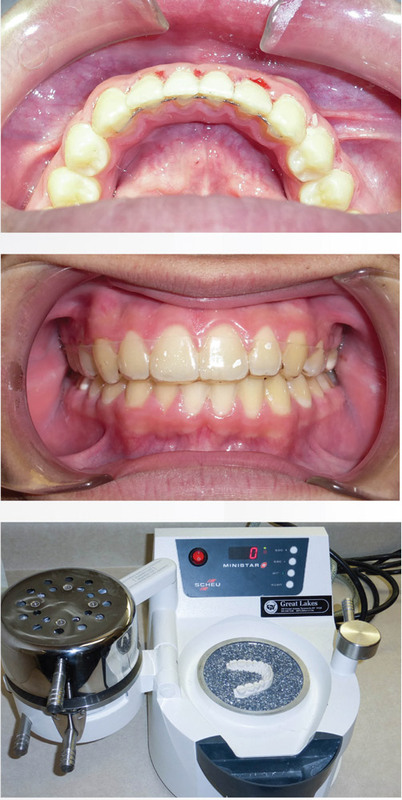 There is less gingival irritation, and they are easier to replace and fabricate. Another form of reliable retention is with an Arrow clasp. It has all the retentive power of an Adams clasp, and the ease and adjustability of a ball clasp. The crescent clasp is another, lesser-used system, and is distinguishable by its curve. It is soldered onto the base. The L clasp is a form of retention for Phase I and post RPE cases. It fits over the buccal headgear tubes and allows the doctor to leave the bands in the mouth. A Cowhorn clasp is soldered to the labial bow that not only holds it, but also allows the doctor to close a diastema. A great way to hold all of the teeth where they are is the Serrano fixed retainer. It came about in the late '80s when Dr. Paul Serrano and I were trying to figure out a better way to hold the lower teeth exactly where they were. The fixed retainer is a wire that is bonded to the lingual of the lower anterior teeth. 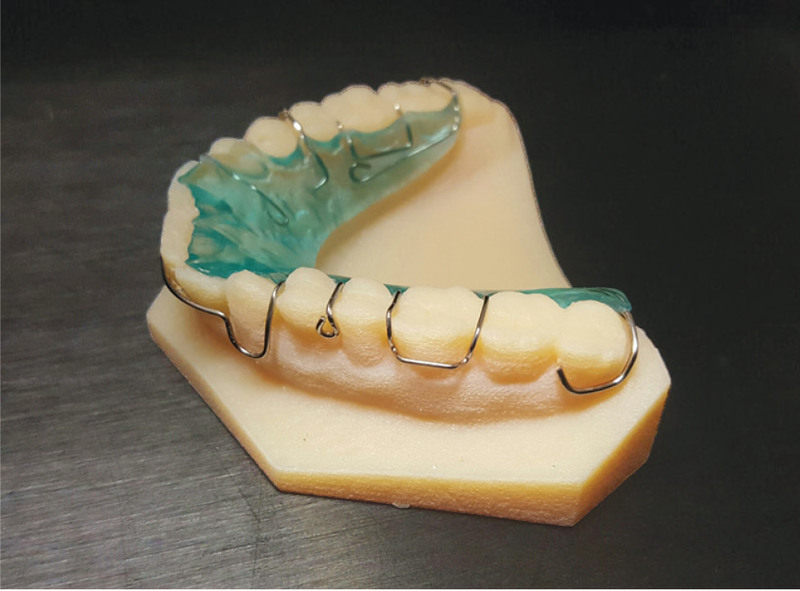 The traditional fixed retainer was made out of stainless-steel wire and could bend if a patient bit down hard on food. That, in turn, would make the teeth shift. Because of this flaw, we later came up with the idea of using a TMA wire, which would not bend. Rather, if pressure were put on it, it would come off instead. That way the teeth are still in the right position. The wire is loaded into a clear tray and cemented in using the light-curing technique. Lastly, there is mechanical retention, which is a form of retention that does not use a clasp at all. Instead, it uses the height of the tooth's contour and engages the proximal spaces in a way that creates a tight fit. 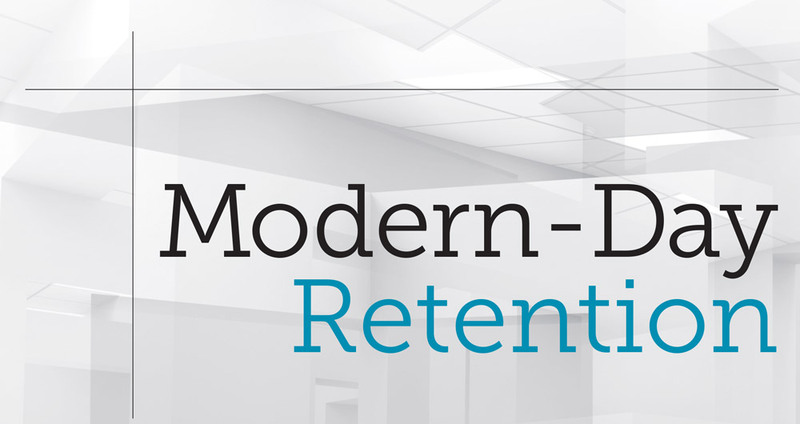 The options out there for retention are vast and highly modifiable. As unique as treatment plans can be, there is always a form of retention that will best suit the needs of both the patient and the orthodontist. Ever since a classic article written in the '80s by Little and others, we have been aware of the fact that teeth do continue to move, no matter how they are treated. I always smirk when I hear speakers brag about their results and insinuate that because of their specific treatment approach, the teeth that they have aligned will maintain themselves. In an article entitled “Retention, Retainers May Be Forever,” the modern-day challenges of keeping teeth straight are discussed by Parker. 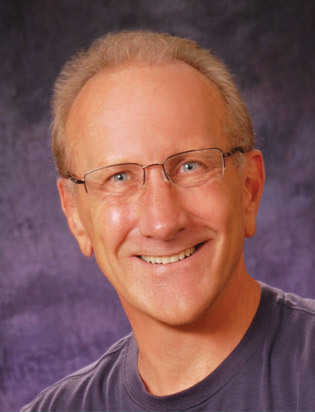 This clever clinician documents various patients in retention and comes to the conclusion that if there is something in orthodontics that is unpredictable, it is maintaining straight teeth. He admits to the fact that even the patients with the least problems in the beginning are often the most difficult to maintain. influence of facial muscles and airway. Contacts that slip or that were never perfectly aligned can lead to crowding. This would include teeth not positioned within the supporting bone. Continued growth of the patient can place varying forces on the face musculature and alter the occlusion, which can cause crowding. A changing TMJ can also alter the occlusal loading, resulting in teeth without opposition—leading to drifting. Of course, digit habits lead to muscle imbalance, which once again places forces on the teeth probably stronger than the forces that we utilize to straighten the teeth. All of these things point to a very simple question with very complex answers: What's an orthodontist to do? As advocated by Parker, explaining to patients that retention may be forever is our only choice.2 Although it would be nice to have the magic treatment mechanics that ensure 100 percent success, this just isn't the reality of today's treatment options. All that we can do until that day comes is to work on increasing our retention batting average. As we approach the last several months of active care, the patient is advised that he or she will soon have the appliances removed and enter the retention phase. A panoramic X-ray is made and appointments are scheduled for re-bracketing if necessary, and a couple more visits to detail and finish. During each of the next appointments, some posterior braces are removed, the occlusion is adjusted and settled, and final elastics are prescribed if necessary. As we enter this period, the patient is given retainer options, depending on our suggestions. We include—as a standard—vacuum or pressure-formed clear retainers as suggested by Rowland and others,3 because of this method's scientific support. Also, we are able to manufacture them in the office quickly and affordably. One of the options, for an additional fee, is a bonded lower and upper retainer, but only when the hygiene and occlusion permit. This option, suggested and supported by Zachrisson,4 has been proven to maintain tooth alignment as long as the set is intact. For others, we suggest the retention product from Invisalign, Vivera, which gives the patient four sets of retainers. 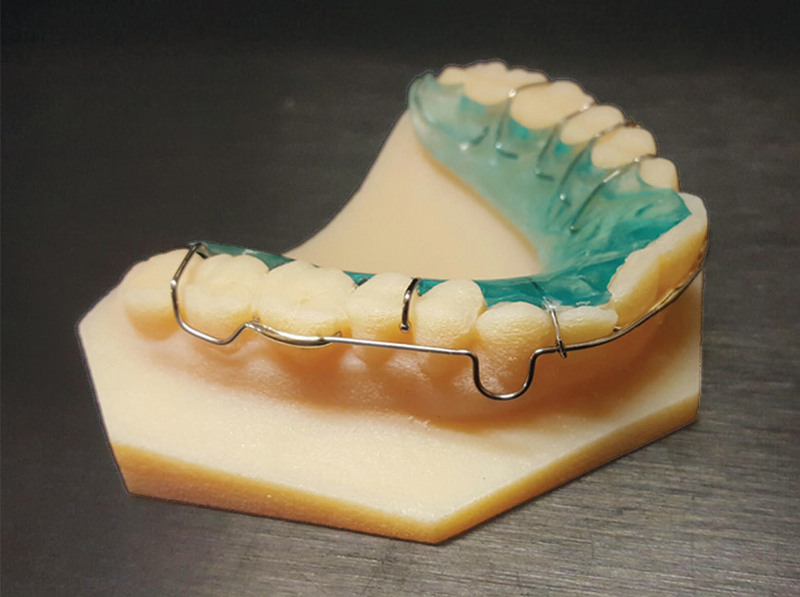 With new scanning technology, most of these can be made in advance of the final debanding appointment, allowing for no time between removal of the appliance and the delivery of the retainer. Many say that these options should be included in the original fee and, to some extent, I agree. However, patient compliance and treatment results vary, as do costs and materials. Having options at the conclusion of treatment allows for some financial adjustments, as well as the ability to take advantage of new technology, such as scanning and colored acrylics. There are multiple types of retainers with many clasp designs. It's often difficult for middle and high school kids to comply with wearing these types of retainers. Our philosophy continues to be that wearing a retainer—of whatever type—is what's most important. The type is not relevant. Retainers are delivered and we insist on full-time wear for three months, followed by nights only after that. Third molars are discussed and their removal suggested in most situations, even though the science is still inconclusive on that topic. The comment we make to patients is that it is better to have them removed on the patient's schedule, rather than the third molar's schedule. These days, we offer bleaching, suggest bonding of small laterals by selected dentists, and enroll siblings. The topic of retention may be ignored in the literature, but definitely not in our practice. Dr. Daniel Grob graduated from Marquette University, where he received all of his dental, orthodontic and prosthodontic education. He was also honored with numerous awards, including the OKU honorary dental fraternity, as well as the ASN honorary Jesuit fraternity. Grob received the American Society of Dentistry for Children senior student award for his exemplary work with young patients.